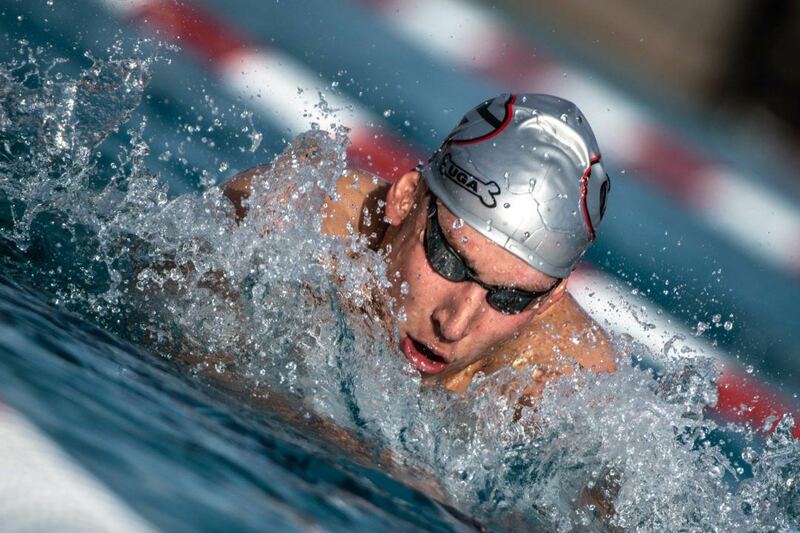 Both Chase Kalisz (above) and Leah Smith enter US Nationals with leads, though they’re not insurmountable ones. 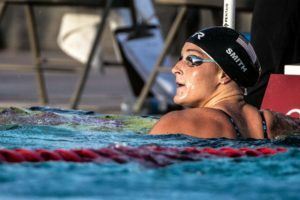 Leah Smith took over the Pro Swim Series points lead from absent Melanie Margalis, while Chase Kalisz expanded his lead over Zane Grothe with just one Pro Swim Series scoring event remaining. 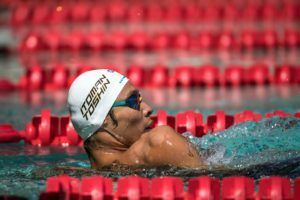 The battle for the 2018 TYR Pro Swim Series title is coming down to the wire on the men’s side, while two contenders for the women’s title are trying to make up ground while their opponents race elsewhere. 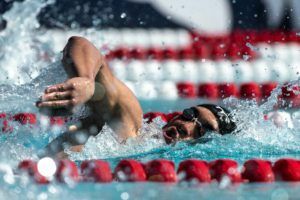 Via points accrued at the series’ 7-meet stop, plus double points left to be handed out at the end of July at US Nationals, swimmers are competing all season long for a $10,000 cash prize, plus a one-year lease of a BMW. Only Olympic events yield points at the series, meaning no stroke 50s. Noting that there are still a ton of points to be scored at Nationals, the men’s race is a two-swimmer battle between Chase Kalisz and Zane Grothe. The next-closest swimmers, Nathan Adrian and Ryan Murphy, have just 38 points each, meaning that even before the Columbus stop, the gap between them and the title was 4 titles + a 3rd-place finish at US Nationals (where points are doubled). And that would be if neither Kalisz or Grothe scored another point, also unlikely. On Friday evening, Kalisz picked up 6 points thanks to a win in the 200 breaststroke and a 3rd-place finish in the 100 fly. That lifts his total to 85 points so far. Grothe for his part had his best swim of the meet, knocking exactly 8 seconds off his prelims swim for a 3:48.69 and a 5-point event title in the 400 free. Added to his runner-up finish in the 1500 on Thursday, he’s now earned 8 points at this meet, added to the 77 he had to start, and the men’s race is a dead-heat with 2 days of racing, plus Nationals, left to go. If it weren’t for US Nationals, Melanie Margalis would be effectively guaranteed of the women’s title. However, entering the meet with a 10-point lead over Katie Ledecky, and with Ledecky capable of winning at least 4 individual events at US Nationals (which would be worth 40 points), Margalis’ choice to race at the Bulldog Grand Slam in Athens instead costs her an opportunity to build a lead heading toward Nationals. Instead, the 4th-and-5th place women in the standings, Leah Smith and Kelsi Dahlia, have a chance of making up some ground on the field. Both did so on Friday, with Dahlia scoring 5 points via a win in the 100 fly (57.28), while Smith did the same with a win in the 400 free. Both swimmers will have opportunities to continue scoring on Saturday: Dahlia is the 2nd seed in the 50 free, while Smith is the 3rd seed in the 200 free (the top 3 seeds are spread by just .01 seconds at each rung). Remember that Taylor Ruck, who swims for Canada, won’t compete at US Nationals, so she’s a non-factor in the race for the title, even symbolically.